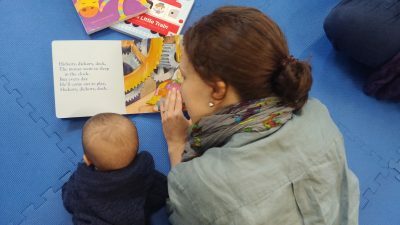 OK, so I’m the first to hold my hand up and say that I didn’t do this very much with my own babies despite being told it was beneficial and that I should do some of it every day! If I put my eldest on his front he objected somewhat loudly and my youngest would just get sat on by his brother if I tried! So where was I going wrong? Through teaching Kindermusik, I realise that plonking them on their tummy and saying ‘get on with it’ is not really the done thing so, as in class, I thought I’d suggest alternatives! Firstly, why do we need to do it? Research[i] has shown that babies who are placed on their tummies (prone position) to play during waking hours reach motor milestones significantly earlier than their peers who spend little or no time in this position. The prone position strengthens baby’s head, neck, back, and core muscles and stretches the muscles located in the baby’s abdomen, chest and front of hips. This strength provides a good foundation for rolling and crawling and gives them a different orientation in the space around them. Even once a baby is crawling, encouraging them into this prone position to crawl develops their balance, spatial orientation and physical coordination. Babies are, quite rightly, encouraged to sleep on their backs (supine position) but for the rest of their day, do need to experience different spatial positions to develop those muscles not used on their backs. Nothing better than a cuddle during tummy time! Plonking your little one on their tummy whilst you go and wash the dishes or sit down with a cuppa might be worthwhile for you but, at least initially, will not be for your little one. Not only are they now in a position that they might find strange and unfamiliar, they’ve also lost their comfort blanket – you – in the process. Getting down on the floor with your child and giving them the reassurance they seek can work wonders to overcome this distress. There are other tummy time positions that involve the caregiver being at close quarters and giving you some welcome bonding time (see below). This is absolutely key for successful tummy time – no baby really wants to face-plant the floor! Improper positioning is one of the most common reasons why babies resist tummy time. If you are putting your baby on the floor for tummy time, roll them over from back to front gently by supporting their shoulder as you roll – this way they transition to the prone position gently, therefore avoiding any abrupt change. For very small babies, putting a rolled up towel under the baby’s arm pits can raise them off the floor and give additional support to avoid face-planting! Help your baby to spread out their fingers on the floor or support themselves on their elbows so that they are comfortable. If the adult also gets down to eye level, the baby will have an incentive to raise their head to make eye contact. Tummy down on adult’s chest: This has the added benefit of baby being on a warm, familiar surface and is excellent for bonding. Placing a pillow or towel begin the adult’s head will raise it comfortably ready for eye contact. Placing across the legs: The adult can stretch their legs out in front and raise one leg slightly to rest the baby’s upper body on. The adult can then massage the baby’s back or legs for comfort and provide a prop for the baby to look at and interact with. Being raised from the floor means they can support their head in a straight line with their spine rather than having to lift up the torso to look up; a great position for smaller babies. The leg flying position: This is a wonderful and fun position for parent-child bonding. With the adult on their back with knees bent and legs parallel to the floor, baby is carefully placed on the adult’s lower legs so that they can enjoy face-to-face interaction with the adult at all times. The adult must keep hold of the baby securely but once the baby is familiar with this position, the legs can be rocked forwards and backwards or sideways to add some vestibular stimulation. Rainbowshakers or sensory bottles – these are exciting to look at, make a noise and can roll too therefore encouraging your baby to stretch and reach for it. 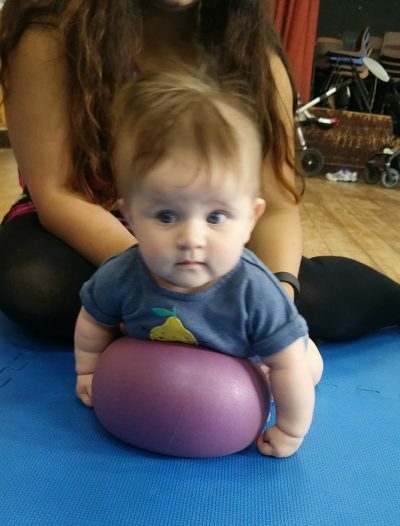 Balls – a hit with all ages, a small ball for tummy time will encourage your little one to shift their weight to grab it. For younger babies, they can follow a ball with their eyes from side to side or forwards and backwards to help strengthen their eye muscles. Mirrors – looking at themselves (not that they know that!) 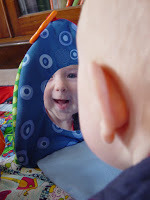 in an unbreakable mirror will keep them entertained for ages! Babies love looking at faces and if you can come behind them to look in the mirror too, this will give them additional emotional support. Finally, keep tummy time short! In the early days of a baby’s life, 30 seconds may be more than enough for your little one. Little, often and varied is key – as they get older, they will want to spend more and more time on their front as they work out how to wiggle around and move.